During the winter there are some pests that hibernate or migrate, although there also are a few that will stick around. The insects that have a tolerant to freezing or have other strategies to reduce the risk of dying out during the winter stay to bug you. Here at Ecotech we thrive to remove any creepy-crawly nuisance you may face in your home or business in a safe and environmentally clean way! We can also prevent the annoyance from returning by helping you with pest prevention and any damages they may have caused, call us today! 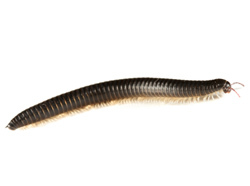 That long, slick, quick, species that is scurrying around in your basement very well could be a millipede. The millipede has many tiny jointed legs that helps the arthropod shuffle from place to place. The millipede problem in Minnesota is common because they can survive during the winter, looking for places to stay warm. They are commonly found in dark, humid, and wet places in your home or business. Here at EcoTech we can eliminate your problem in a healthier way and keep them from returning! We cannot stress the importance of lice prevention in the winter time. When it is cold outside you and the kids are bundled up the lice pest is a very common intruder during this season, transferring from person to person during an outbreak. Call a professional lice exterminator to help you and your family stay safe inside your home with our process to treat your house inside and out. We will also give you tips and pointers you yourself can do as well, call us today! Although the scary back story of the earwig crawling into people’s ear to hatch a harvest in your brain isn’t true, the fact that some survive and maintain life during the winter is. Mainly found in woodlands but also in furnace rooms if you burn wood or gardens, the earwig is commonly a nocturnal insect that looks like a small beetle with two pinchers on its backside. If you see one, just know you will see them all. Earwigs commonly stay in their infestation, if you have a problem with earwigs. Call us today to let a professional exterminator help you deal with the tricky pest!